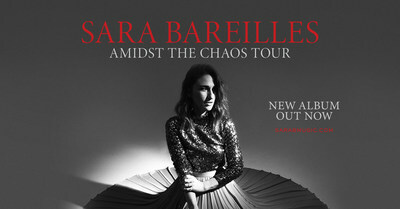 LOS ANGELES, April 8, 2019 /PRNewswire/ -- Grammy, Tony and Emmy award-nominated singer, songwriter, actress, and author Sara Bareilles today announced her Amidst The Chaos Tour. Produced by Live Nation, the 30-city tour will kick off October 5th in Detroit, MI and make stops in Boston, Chicago, Houston, San Francisco and more, before wrapping November 26th in Atlanta, GA. The tour will also include stops at the iconic Madison Square Garden in New York City and the famous Hollywood Bowl in Los Angeles, CA. The tour brings Bareilles on the road in support of her fifth full-length album Amidst The Chaos which was just released last Friday to rave reviews - with Variety stating it "establishes that there's no one in contemporary pop better at flexing mezzo-soprano sensitivity and social empathy like a muscle. It's the perfect album for anyone who could use a little fierce snowflake pride." This marks her first album of original material since 2013.